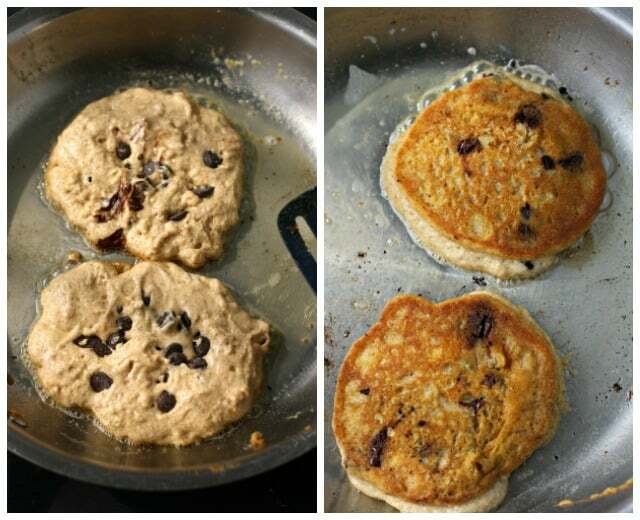 Home » Breakfast » Vegan Chocolate Chip Pumpkin Pancakes. 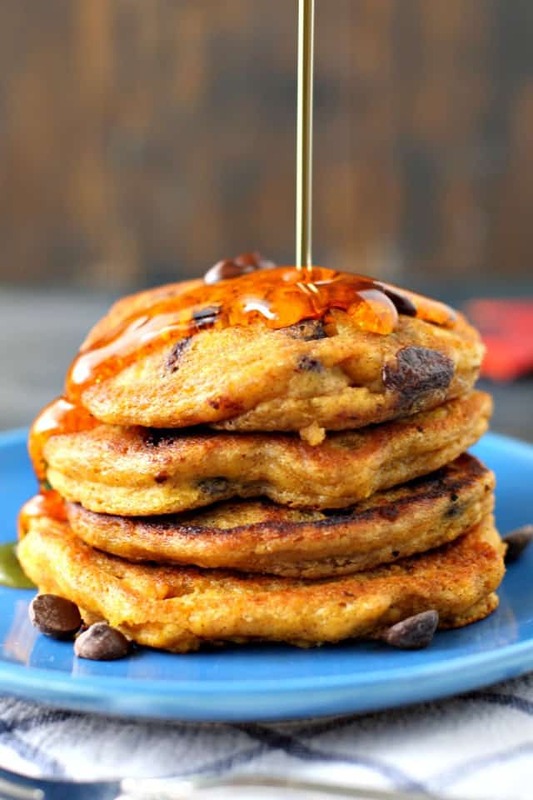 Vegan chocolate chip pumpkin pancakes are light, fluffy, and full of pumpkin spice flavor. Enjoy a stack of these on the weekend for a special breakfast. 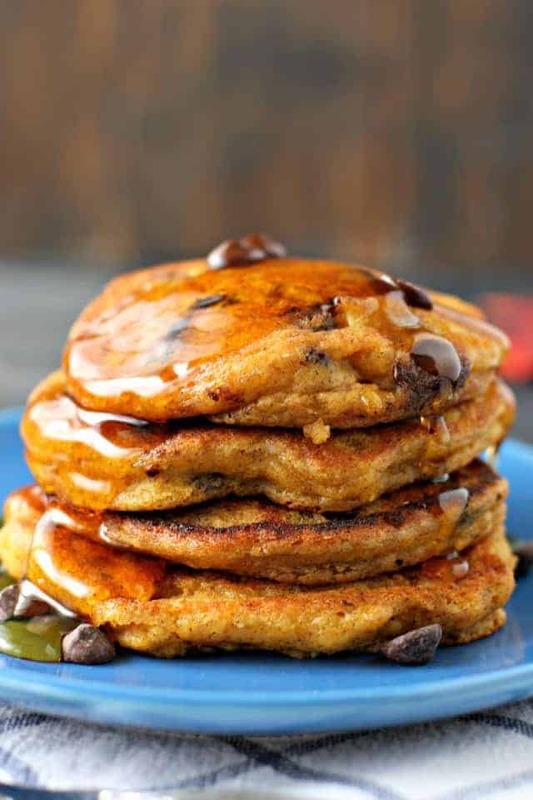 There’s nothing like a stack of vegan chocolate chip pumpkin pancakes on a chilly fall morning. Light and fluffy pancakes, melty chocolate chips, and warm maple syrup – it’s the perfect autumn combination. You might wonder if it’s difficult to make vegan pumpkin pancakes from scratch – the answer is no, not at all! It’s just about as easy as using a pancake mix. You’ll need to add your own spices, but this is a simple recipe that can be made in one bowl. Can you make pumpkin pancakes without eggs? Yes, you can easily make pancakes without eggs, and guess what? No one will be able to tell the difference! These pumpkin pancakes are just as delicious as any traditional recipe. Pancakes are one of the things I’ve missed the most since going vegan and none of the previous recipes I’ve tried have come anywhere close to tasting authentic, but these are sublime and come out exactly how I like them. They have the taste and texture of regular pancakes and have that great crispy edge that I love. Highly recommend. 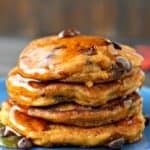 How do you make vegan chocolate chip pumpkin pancakes? Mix the ingredients for the batter in one bowl. Let the batter rise for about 5 minutes. It will puff up significantly. Once the batter has risen, place vegan buttery spread in a frying pan and heat over medium heat until it is sizzling. Spoon the pancake batter in the hot pan, and allow to cook for about 3 minutes, or until the edges look done. carefully flip the pancakes, and continue to cook until golden brown and crisp around the edges. light and fluffy, and full of fall flavor! If you make this recipe, or any of my recipes, please share on Instagram, and tag me @prettybeeblog. I love to see what you’re cooking! 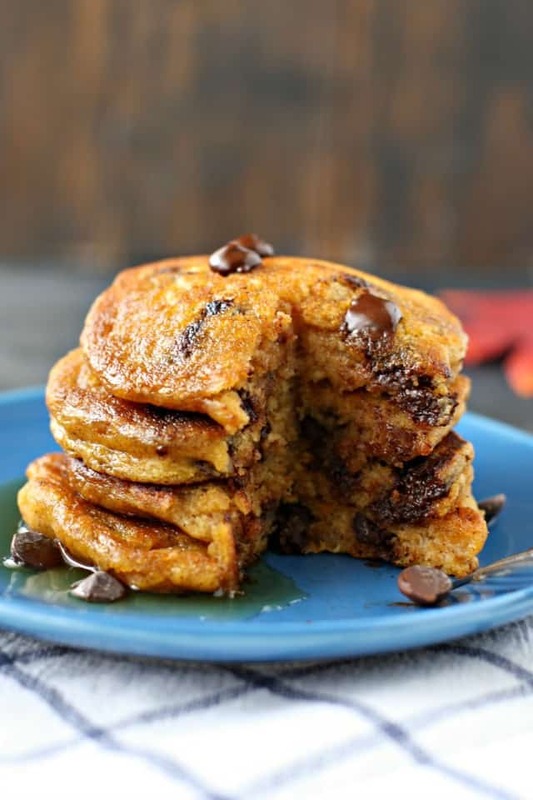 Delicious vegan chocolate chip pumpkin pancakes are perfect for fall! These light and fluffy pancakes are sure to be a family favorite. In a large bowl, whisk together the flour, baking powder, sugar, cinnamon, ginger, nutmeg, and salt. Add the pumpkin puree, melted vegan buttery spread, non-dairy milk, and chocolate chips. Stir well. Set aside to let it rise for about 5 minutes. 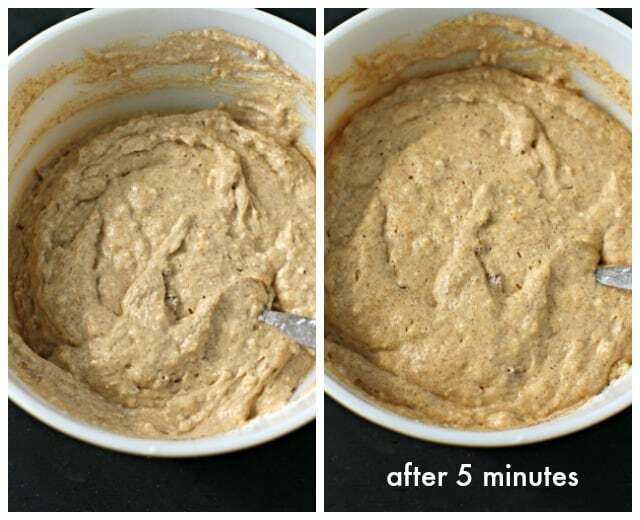 Place a tablespoon of vegan buttery spread in a large skillet, and turn the burner to medium heat. Once the buttery spread is sizzling, spoon the batter into the pan, making the pancakes about four inches in diameter. When the edges of the pancakes look cooked, flip them over. It may take about three minutes on each side as these are very moist due to the pumpkin. When the pancakes are golden brown on each side, remove from the pan and repeat with remaining batter, adding more vegan buttery spread to the pan each time. Serve with buttery spread and maple syrup or cinnamon sugar. Serving size is two pancakes. These also freeze very well - wrap each pancake in waxed paper and then place in a freezer bag. If you don't have pumpkin puree, you can use butternut squash puree. If you aren't vegan, go ahead and use your regular butter and milk. This post was originally published in September 2015. It has been updated with new photos and text. « How to Make a Chia Egg. Why does it say this makes 4 pancakes? It makes soooo much more! These are very good! I have not tried that yet, but if you do, use a lighter gf flour blend, something like King Arthur Multi Purpose GF flour (if that works for your dietary needs of course). Oh my goodness, Kelly! These pancakes seriously look SO ultra-moist and fluffy I can hardly stand it! SO fun with both the chocolate and pumpkin addition. I think I need a tall stack NOW. So excited that it is pumpkin season! These look amazing! I can’t believe it’s pumpkin season already but this is definitely the way I want to start it! They look so fluffy! I’m making my first batch of pumpkin cookies this weekend. These pancakes need to make an appearance one morning as well. These look so moist and delicious! Pinning! Yes, pancakes every weekend Saturday and sunday…no question! And yes! Pumpkin pancakes have happened for weeks now….no regrets! Good for you! Pumpkin pancakes are so good! I’d munch through those pancakes with no regrets!